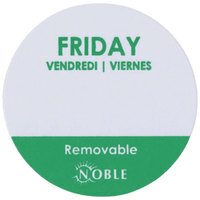 Use this Noble Products Friday removable day of the week label to keep your kitchen and pantry organized! Great for First In, First Out (FIFO) organization of perishable items, this 1" round label features a green border on the bottom and green print on a white background, making it easily identifiable. Since it's preprinted with the day of the week on it, staff will only need to fill in a date or intials in the blank space, and any other product descriptors. This ultimately saves time and makes it easy to always know exactly what you're pulling out of the fridge or freezer. This trilingual label features "Friday" written in French, Spanish, and English for additional convenience. These are great! They hold up for multiple days in the fridge. Strong enough to hold until your food is ready to use, but also come off fairly easily! Product is as shown, holds up well, fairly easy to remove from lids (if used that way). Only downside noted is that if you use the dispenser, occasionally a "jam" will occur where labels do not come off tape. easy to peel of the roll but really hard to get out of the containers.. if you put it in the dishwasher they will stick and only can be removed with alcohol.. Thank you for the review, Laura. We’re sorry this has not worked well for you. We recommend pulling off the labels before placing your food storage container in the dishwasher. Washing these labels can make them hard to remove and more likely to leave behind a sticky residue. The Friday 1" removable day of the week labels were satisfactory. They did not really impress us because they lost their stickiness after a few days. We always find these stickers falling off and ending up at the bottom of our fridge. Purchasing these labels help with my meal preparation. They’re easy to read and make the time you spend on preparing time well spent since you’ll know when things expire or what day you’re supposed to eat that meal. This one thousand roll of Noble Products one inch Friday Removable Day of the Week Labels has worked very well. The half white and half green background make it easily recognized and the adhesive has been strong thus far. I would recommend. A great refill for the removable say of the week label stickers that came with my Noble brand elevated 7-slot dispenser for 1" day of the week stickers! These "Friday" labels by noble are perfect for labeling food. Most food is only good for a week or less in the refrigerator so just sticking a day of week label on is so easy. There is room to write a date if you wish. Marking food items for food safety is one of the most important things a restaurant needs to do. With this color coded label, you can clearly mark that the food was placed in the container on a Friday then simply write down the date. It's easy to wash the sticker down in dishwasher. We love this colorful stickers. It's really easy to organize the fridge and make sure that you have always only fresh products available. Used the Noble Products Friday 1" Removable Day of the Week Label - 1000 / Roll to label sausage patties. Make sure you also put the date on it to ensure you don’t' eat expired food. These stickers are a great buy. They are a huge help in our bakery and cafe for keeping items fresh for customers. They stay sticky and are an all around good product. I wish the day was a little bit more bold. I don't really need to write anything in these tiny labels. Really good price though. We have been using a dating system that we made up and is so outdated and time consuming. We find this product is easy to use, can be removed, and has the space to include a date if needed. We get advanced orders daily and we find it easy to organize them and even easier to find them. We use them for prom flowers which we file by color and number. We put a number on two labels and place one on the order and one on the product. We put our orders in numerical order and can find the product much easier than an alphabetical name. The product is also put in numerical order for locating quickly. These are great for a kitchen that needs to start a rotation system. There is space on them to write the date which is helpful. We would be lost without them. Best stickers we have ever used! Our local health inspector completes us time year on our use of these stickers and also keeps ensure nothing goes bad and gets wasted. These Noble stickers are the best! A clean and neat way to organize your prepped foods and making sure all your prepped foods are fresh before they make it on the line. We saw these while we were looking for other items. we bought the whole system -- the dispenser and all 7 days. They are very handy and the dispenser adds one more level of ease of use. We highly recommend them. TGIF, and thank god we have these stickers. Makes dating our product much easier, and the price allows there to be a full set in many locations. First of all, I love that these remove easily (but not accidentally) without leaving behind any residue. These color-coded labels are a key part of any FIFO food rotation system. They're great for tracking received products as well as prepared products. Love the shpe, color, size, PRICE, shipping and durablity of the sticker. Need to find these in a set that you can pick the days needed. That would be a wonderful advantage. These are great labels work very well and are great for pans that sit in the coolers because you can put these labels on top of the pans and they work great that way!!! This stickers are awesome. They stick great to any container you need to use them on different colors help keep track of the days and have lots of room to write the date and what product is in container. These little labels are great addition to our cafe. They help to identify the day a particular product is prepared especially with the different color code for each day of the week. We have used these for about 2 years and have never had any problems. Consistent product, great sticking power and easy to remove. Overall a good product. Great day label! They dissolve very easily with hand washing as well as in the dish machine. They are very bright making them visible so you will never forget when you made something! This sticker is unlike the rest. It is easy to get off of containers and after accidentally getting wet and stays on well for up to a week. These are a great way to keep track of your product freshness. They are easily removable in case you made a mistake. The only downfall is that customers look at them and sometimes throw it around to get another with a closer date. If only these are made only with the same colors and no wording cause we will know the date after a while by the color code. I've got a roll of each of day, along with 'use firsts,' on a stick going across the end of the food prep area. Since I've become strict about them getting used, I would estimate I've seen the amount of food we throw away drop by 40%. I'd recommend these to anyone. I keep rolls of these for every day of the week. We mark everything in our kitchen to make sure things stay as clean and sanitary as possible. Great pricing, easy to read, hold up in cold temps and a room temp. Labels stick very well, and they remove easily with no sticky residue. We use these removeable peel-off stickers on every item we prep. We'd tried washable ink date stamps (they smeared...) and non-removeable labels (they left a gummy residue on the outside of our prep containers)... These are the best method we've found. I like these labels because they are big and have a space to write in a date or product name if I need to. They also should be peeled off before the container gets wet so they don't stick. a must have for food cost control. I wish they would remove with out leaving a sticky glue. but not to bad order all the days. These are a great product for quality control. you gotta follow fifo. first in first out. youl be able to quickly and safely rotate product with day labels. Great stickers for the kitchen! A must need for any kitchen that wants to be organized! Sticks easily to plastic wrap! Easy to write on! Great replacement for day label dispensers! These tri-lingual labels work great in conjunction with the plastic holder for any establishment looking to be rid of the masking tape system of container labeling. We like these day labels because they are brightly colored so they easily catch customers' eyes. It helps employees know when to throw things out and customers know when to eat them. This little dynamo is an effective label. It has an area to write on it. The adhesive on the back is adequate & is easily removed from plastic or metal containers. Priced right, as well!! !